For awhile now, Nacho Patrol has attempted to skirt around the issue of Fenway Park. Sure, we’ll hit up the local bars (think Uno’s, Beer Works, Lower Depths, and Cask & Flagon), but to delve deep into the heart of the Green Monster had until recently been financially and socially prohibited. With a nacho team cheaper than a a Rhode Island prostitute and just as athletic as those kids you threw balls at in middle school gym class, we shied away from embracing the high life (that not of the Miller variety) within the dodgy green walls of Fenway. Fortunately for you, though, one of our Nacho Patrolers happens to rabidly love the Minnesota Twins, and with the help of some loyal friends we finally are able to broach the subject of the Fenway Park Nacho. Like other concession stand nachos, these were overpriced and of low quality. But if you can stand to pay $7.25 for a glass of Coors, than you can step over to the Nacho stand (we went to the one by Gate C) and enjoy the Nachos Grande. Appearance: ( 6 ) Thank the Good Lord Joe Mauer for concocting pre-melty plastic bag cheese sauce! A staple of concession stands and 7-11’s everywhere, this pale orange goo set the stage for the unexpected melee of colors and textures in this nacho bowl. It’s sheer viscosity created a veritable swimming pool of spicy goodness–so much so that by the end we couldn’t even find chips in the vast possibly-carcinogenic food-sea. They must put drugs in the rain water of Fenway to make us forget just how nasty the food looks and eat it with all the unmitigated joy of a kid at Christmas. Distribution of toppings: (5) One can refer to “appearance” for a note on the cheesy sauce, but overall the distribution left something to be desired. As you may or may not know, one will not find a fork or spoon anywhere in the 36,000 seat stadium. What you will find is a nacho plate that starts off with naked chips galore and ends in a soupy mess that one must savagely devour with one’s fingers while praying that one does not end up on the stadium scoreboard. We suppose this is to be expected, though, when 3/5ths of the ingredients are semi-gelatinous at eatable temperature. Quality of toppings: (3) while the rain certainly didn’t help out the already soggied Nacho’s Grande, our real problem lies in the form of a Costco-sized container of Sysco-brand Chili Con Carne that so inelegantly made our unhealthy snack just a bit worse. If you follow our little nacho project, you will know that Nacho Patrol greatly values fresh ingredients. Even Disney Land had some fresh chopped tomatoes on their concession nachos, but no such luck here. Extra salty tortilla chips, the aforementioned cheese, sour cream, jarred jalapeno, and canned chili gave us exactly what you’d expect from the concession stand–if a bit fancier. Price: (4) $7.50. Are you kidding me? We were ready to call it highway robbery until we looked around and realized we were in a Major League Baseball stadium. Still, this could easily be a filling meal for one or a pleasant snack for 2-3. Dismal, yes, but not unexpected. 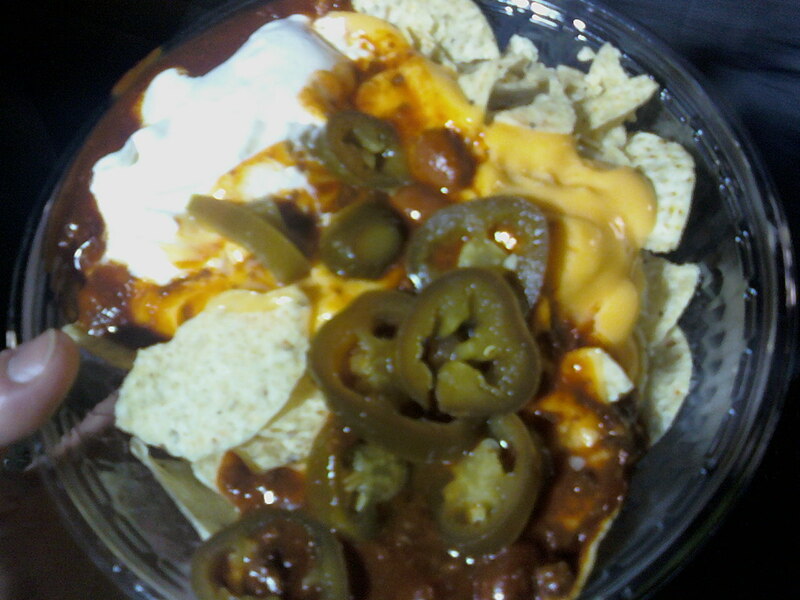 For concession stand nachos, these were top of the line. We wish that was saying something.